(2) Fantasy books are usually big honkin' novels. The first reason is just a matter of preference--magic wands and whimsical pixies aren't as appealing to me as laser beams and bizarre aliens are--but I do like the occasional fantasy story if it's either exceptionally executed or if it downplays or omits mythological figures and fantasy stereotypes such as beer-swilling dwarves, aloof elves, and grungy trolls. Pure fantasy, not recycled and retouched fantasy, is the only kind of fantasy that truly appeals to me. Sadly, I've seldom been exposed to anything remotely resembling pure fantasy. However, the fact that fantasy books are usually big honkin' novels is the real reason why I've never read any Piers Anthony or Terry Goodkind or anything beyond that part of Fellowship of the Ring where the Black Riders are crossing some river and they all drown in a flood caused by Liv Tyler. I simply don't have the attention span or patience for novels unless they're absolutely spectacular and overwhelmingly engaging, or at least very funny. Free time is a precious commodity, and sometimes it takes several hours to determine that a novel is a waste of my time, and at that point I can either cut my losses right then and there or plow through to the end in the feeble hope that completing the book will make up for all that time wasted on reading it. Novels are a risk of my free time, and fantasy novels are almost a sure-fire misuse of my free time. That's why Lords of Swords was such a great read. 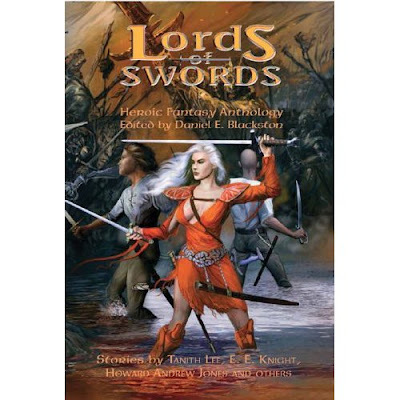 Lords of Swords is a book filled with short stories by a variety of notable fantasy writers, including Tanith Lee, E. E. Knight, Howard Andrew Jones, Vera Nazarian, D.K. Latta, and Nancy Virginia Varian. At least, I assume they're notable, but for all I know these could be pseudonyms for a single author with a Fantasy Author Random Name Generator at his disposal. In general, I dig short stories because it's much easier to jump ship early or just plow through to the end of a lousy story without it feeling like a huge waste of time. More importantly, I'm big on unique concepts, and I feel short stories are better suited to exploring creative storytelling techniques and innovative "What if?" scenarios than novels, which would be forced to stretch that single unique concept into something that could all too easily become tired and tedious after several hundred pages. Truth be told, I'm usually more interested in the situations than the people involved. All that being said, it's no wonder Lords of Swords was so appealing to me. While there are your typical action-filled sword-and-sorcery stories (after all, the book is called Lords of Swords), there are also high-concept stories built around a unique storytelling technique or a wicked plot twist. Some stories have fantasy creatures and rampant magic, but some don't. Some authors give a great deal of description, while others leave most of it up to the reader's imagination. Some stories are a few dozen pages long, but some are barely half a dozen pages long. There's more variety in this book than I'm accustomed to; most of my experience with the fantasy genre has been people putting their own spin on the universe Tolkien created with The Lord of the Rings, and it was highly refreshing to discover that fantasy can be just as diverse and clever as science fiction, my genre of choice. Best of all, if I started to grow weary of a story for some reason, I could simply skip ahead a few pages and start a new story; I didn't need to give up on the entire book or force myself to keep reading. In this format, reading fantasy is neither a risk nor a chore, and I love that aspect of Lords of Swords. A warrior and his talking battleaxe take on the dangerous monsters lurking below a city. Two champions backed by powerful wizards fight for control of a kingdom. A man sets out into the cold wilderness to slay a god. A crew of pirates runs into trouble when they acquire a rare and coveted gem. Lords of Swords is rife with impossible odds and daring-do; the heroics of the various characters, combined with the creativity, diversity, and easy-to-manage format of these stories, made Lord of Swords a great read that comes recommended... even if you don't read the whole thing.